Climate change affects all regions around the world and its impacts are expected to intensify in the coming decades. The consequences derived from climate change are wide-ranging: melting ice and rising seas, extreme weather, shifting rainfall, risks for human health, risks for wildlife and costs for society and economy among other things. Through data gathered by citizens, the Spanish Demo Case aims to demonstrate how climate change affects nature (plants, animals) and how public policies can be improved. The Demo Case will systematically collect phenological data through a mobile app. It covers the region of Catalonia. Located on the northeast of Spain, Catalonia is a showcase of European landscapes on a small case, with 30.000 square km of great ecological diversity and a remarkable wealth of landscapes, habitats and species. So, understanding climate change will help improve local policies and practices. To this aim, and through data gathered by citizens, we want to demonstrate how climate change affects the nature and its rhythm. The Spanish Demo Case team consists of 3 partners: CREAF, Altran and Starlab (the latter leading the Demo Case). The work carried out among these partners went smooth so far. In addition, IHE Delft plays an important role in the preparation and implementation of the co-design process of the Citizen Observatory. IHE Delft leads Work Package 1, dedicated to the social dimensions of the project. Following the plenary meeting held in Barcelona last December, we contacted the identified stakeholders and invited them to join the co-design sessions. 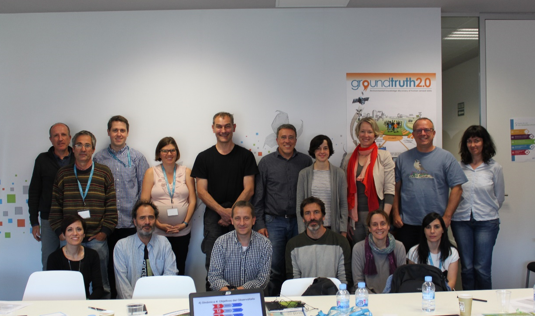 We got in touch with them first by telephone, explaining what Ground Truth 2.0 is all about and what we expect from them and the co-design sessions. After the first contact, we sent them a formal invitation via email. Fortunately, the vast majority of the responses were positive. During the two sessions carried out at Altran’s offices, all stakeholders (academia, science, public agencies, etc) showed their interest and willingness to work with us in the co-design process. The first session, held in March, served as an icebreaker between the stakeholders and the Demo Case team and resulted in several important inputs. The participants, through their responses and group discussions, provided feedback on questions such as: How can we define the central challenge? ; What is the purpose of the Observatory? ; How do I imagine the Observatory in the future? These questions and more unleashed very useful outputs for the design of the Observatory. A third co-design session is planned this month, dedicated to the features the Observatory should cover. We have already started to prepare for climate change. This blogpost was written by Iñigo Lamsfus from Altran. The project partners take turns. Come back next month for a blog by Stockholm University!